Holy Schnikies, my flying monkeys have just come in with the news that there's going to be a free festival saturday in Ancoa... sorry, New Islington, forgot about that company-approved rebranding. Anyway, you can read all about it here. 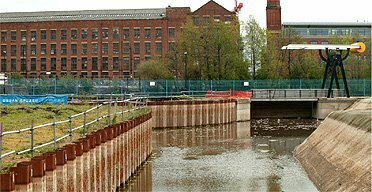 According to the swankified website, "The New Islington Festival is a celebration of the creation of Manchester’s newest and hippest place." I didn't know you could create hipness. Is it like sea monkeys? Basically, this is a big fat advertising opportunity for Urban Cash's latest regentrification project. Bread and circuses, dammit. 'But who cares,' I hear you saying, 'they're going to have a stage on an island.' Yup, and all kinds of djs, including the ubiquitous mr. scruff, votel, diablo, plus Broke n'English and a whole bunch of other bands I haven't heard of. Plus an act called The Spurting Man (think I saw that one on the last train to Chorley Saturday night) and some kids' artsy stuff. Someone's bound to fall in the canal, that's all I'm saying. Updated: Just noticed Mancubist has blogged about this too, and has put up some band recommendations here. Love your work - not sure what a Schnikie is, holy or otherwise - but you're spot on. Please move to the East of England - you would be feted as a the auteur-techno-cyber goddess that you obviously are. And there are fewer hills. Hmm, might give this a go after Saturday's game. Which, by the way, is free for children to get in and £7 for adults. BTW....when do I get my site linked to yours, Shizzo? New Islington eh? Dogging round the back of Argos will now feel so refined. yeah, backroads... that's one feature of the neighborhood you never see mentioned in all of the glossy real estate brochures. vitty, mea culpa. Have been working in evil office all week. will catch up with linkage over the w/e.